beautiful and relaxing place, very well situated, and friendly people. Fantastic b&b! Everything first class thank you! Great location for attending wedding at nearby hotel.Breakfast was lovely +owners Padraig + Paula were very friendly + helpful.Would definitely stay again. My stay was very comfortable. The location is a short walk away from the town. The owners were friendly and hospitable and the breakfast delicious. To be recommended. I arranged my booking by ringing the b&b directly. Booking was cancelled due to change of plans. This accomodation was top class and I have since rebooked. This is a lovely B&B, very clean & comfortable, the owners are lovely & very helpful & welcoming, a short walk into town. I'd highly recommend this. Great value for money. Fast confirmation of booking. Excellent location for my needs. I declined breakfast but tea and coffee available in dining room any time. Accommodation was pleasant. I would stay here again. We had a great stay and the owners could not of been more helpful, everything we needed in the room ie shower gel, hair dryer etc. The only item not in the room was tea making facilities but we were invited to make ourselves hot drinks when ever we liked downstairs. Large hearty breakfast provided. B and B situated 2 mins walk from the hotel where we attended a wedding and we had our own key for the late nights - perfect. We wanted to spend two nights B&B near the Hotel next to the Lodge. So glad we did. The facilities were modern and spotless. Views from our window were stunning. 2 minutes from the Cathedral and just a short walk to the local shops and restaurants. Fantastic breakfast and the the owners were so friendly. We throughly recommend Grove Lodge and would love to return for a longer stay. No hesitation to recommend the Grove Lodge B&B. Paula made us feel very welcome. Our room was very clean & quiet, considering the Hill Grove hotel is only a few meters away. The full Irish breakfast was great. We will be back one day. Had a lovely stay here. Felt very at home. Was at a wedding at hillgrove so the location was perfect. We couldn't get any closer Room was lovely and very clean. Very nice b+b. Definately would recommend to stay here. Would definately stay again. Lovely people and place. Room was lovely, good location. Only positive things to say. Well welcome at our arrival, help us with our luggages, nice spacious rooms, good hot breakfast. Down side:owner`s wife came to see us at 22h00 to ask what we wanted for breakfast the next morning, first night, no hot water in one room, ask the owner`s if we could pay with credit card, but when it was time to leave, the machine was not working hum....... The owner`s wife was not smiling, did not really speak with us, or did not look like she was happy to have us, sorry !!! It was a pleasure to stay in this house, exactly what we needed and we would gladly stay again or recommend it to friends. 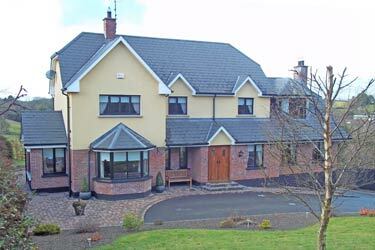 Very nice facility perfectly located in relation to Monaghan Town. Our room was comfortable and spotlessly clean. It was our first bed and breakfast stay during our time in Ireland. When our hostess asked if I wanted a full Irish breakfast I said "sure". Ten minutes later I was presented with a plate of food adequate for a family of four. However it was so good I ended up eating all of it on my own. Truly, our stay at Grove Lodge was a very charming experience. Our host and hostess were gracious and very welcoming. We left feeling some regret that we could not stay longer but felt privileged to have spent time in private home. Comfortable well maintained accommodation. A warm welcome on arrival and received throughout. Good location and convenient to Castle Leslie. Great breakfast. Would recommend as an alternative to a hotel. Even though I didn't get a confirmation email, I had no problem and I could stay the night. The room was just what I needed it, very clean and comfortable. And breakfast next morning was perfect! If I ever go back to Monaghan I won't think twice about booking again at this bnb! Great value. Paula was lovely. Breakfast was wonderful. Room was big. Bed was very comfortable. Come & go as I pleased. TV & Wi-Fi. We had a lovely stay here. The room was a good size, it was very nice and clean and tidy. The lady of the house was very friendly and I would recommend to stay here. My husband and I stayed here for one night due to the local hotel being fully booked for a wedding that we were attending. Excellent location and easy to find. From the moment we arrived we had a warm welcome. Our room was clean and tidy, but did find our mattress quite hard. Breakfast the next day was a full fry up with self service cereal and toast facilities. I would recommend this B&B as it has everything you need for a short stay and at a reasonable price. Nice hotel and well priced too. Would definitely stay again. Very nice spot! So clean and tidy. Lots of room. Paula was very accommodating and helpful. A sweet lady. Would definitely recommend this place. A great breakfast too!!! We stayed in Grove Lodge in a double room. Room and ensuite was spotless. Excellent breakfast. The only downside was we had no tea or coffee facilities in our room. Highly recommend a stay here. We would definitely stay again. The Grove Lodge B&B is a really nice place. We had a family room for 3 persons and were very pleased with the room. The only minor problem is the typical irish mattresses in the beds, these are not "extremely" comfortable and somewhat narrow but they are as we know normal state of the art in Ireland. The breakfast was very nice and the service absolutely perfect. The house is in perfect shape and we recommend this B&B to any looking for a nice place, quiet and with really good service at a fair price. A lovely B&B with a very down to earth landlady. Helpful and the breakfast was lovely, hot and freshly cooked. Excellent location for our purposes. Excellent all round. Friendly owner, privtae room well appointed. Excellent breakfast. Very reasonable rate! We stayed at Grove Lodge for 2 nights whilst over in Ireland for a wedding. The rooms were excellent and the owners went out if their way to help us enjoy our stay. In our case we arrived very late on Friday night and they stayed up to welcome us in. On the second night I ended up in A&E until 5am. When I knocked on the door at 5.30am to be let in they were nothing but polite and welcoming, despite us getting them them up at an ungodly hour. I would definitely recommend this place to anyone visiting the area.